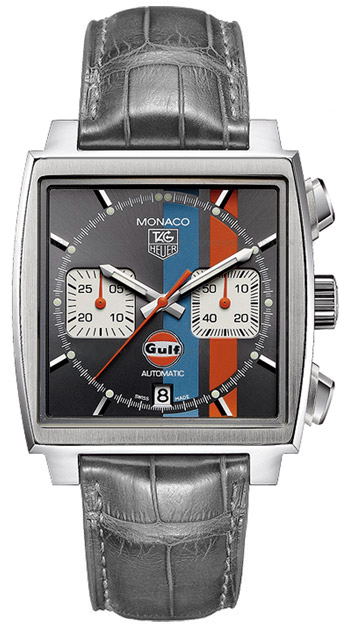 Start your engines and get ready with the 1970 Gulf Porsche 917K racecar inspired timepiece, Monaco Calibre 12 Automatic Chronograph CAW2113.FC6250. The race that started it all was actor Steve McQueen’s famous film, Le Mans, which debuted in 1972. At first glance this stunning watch will make your heart pound faster with its slick blue and orange stripe design inside a square shaped case. The TAG Heuer Calibre 12 Automatic has two sub-counters for minutes and the other for seconds with matching orange hands. A vintage Gulf logo sits prominently in the bottom middle of this Monaco edition. Grey and silver tones set off the orange and blue with the body of the TAG Heuer men’s watch, which is constructed of stainless steel. The masculine black wristband is made of crocodile skin, which closes with push button fold over clasp. The Monaco Calibre 12 Automatic Chronograph comes standard with a sapphire crystal cover that is scratch resistant and water resistant up to 100 feet. The back of the case is unusual with a transparent look. This timepiece is a classic memoir of the 1970s racecar era that offers a unique design not replicated by any other luxury watch company. The current retail price of the Calibre 12 is $5,000.00 and is sold through authorized TAG Heuer retailers.